DONT DEAL WITH THEM!! ... I tried to book at Villa Ulivi in May 2008 giving all particulars. I had no reply or letter of confirmation but had the full amount deducted from my credit card. I have tried all avenues to recoup - no reaction at all!! Villa Ulivi is a remarkably beautiful and luxurious fifteenth century Florentine Villa located few minutes away from Florence's historic city centre and from its main monuments, as well as from the shopping area, up towards the wonderful landscape of an ideal Tuscan hill. The imposing building, characterized by the Italian Villa tradition while incorporating the comforts available today, is set in a residential area that both overlooks and is extremely close to the town’s attractions. Access to downtown Florence is easily attainable by either a comfortable, scenic walk or a short bus ride down the famous Via Bolognese. Both options are simple to navigate for travellers of any age or experience level. Villa Ulivi also has partnerships with scooter and bicycle rental companies to meet all of their guests travel needs. The villa grounds are surrounded and beautified by magnificent vineyards and olive orchards, as well as an array of local flowers and blossoming trees. In spite of its central location, Villa Ulivi is immersed in a garden planted with fragrant roses and lavender, at the end of a shady horse-chestnuts' lane. Villa Ulivi offers travellers an authentic Tuscan experience and allows for a relaxing retreat from the "hustle and bustle" of the nearby city centre. "For centuries Florence has been celebrated for her villa clad hills. According to an old chronicler, the country houses were more splendid than those in town, and stood so close – set among their olive orchards and vine-yards that the traveller thought himself in Florence three leagues before reaching the city." Guests are constantly amazed at how close Villa Ulivi is to the variety of tourism activities in downtown Florence, but, at the same time, how separated it is from the "hustle and bustle" of the busy city. Set in the hills overlooking the town, the Villa is everything visitors to Florence seek in their Tuscan adventure. As guests enter through the large stone gate and look down the private shady lane, they will realize that they are entering a new and exciting world. Pass through the main entrance and gaze up towards the beautiful, golden, eight meter ceilings. Admire the wooden balcony and dangling chandeliers. The ancient stone wine cellar, with three rooms with vaulted roofs and fifteenth century stone frames used for socializing and taste-testing, provides a place to escape and explore the collection of over 1, 500 bottles. Stroll out to the back patio or enjoy a glass of Tuscan wine on the rooftop terrace. Both offer unimaginable views of the unspoilt hillside and city spread. Fernand Braudel described the Florentine landscape as, "The most touching countryside in the world." "You may go forth from the Riccardi Chapel and see the castle of Vincigliata towering on its cypress-clad hill precisely as Gozzoli depicted it in his fresco." This grand Villa captures traditional Tuscan style and atmosphere with the benefit of modern amenities. At Villa Ulivi, furnishings have been chosen with a careful eclectic taste. Tuscan pieces from the sixteenth and seventeenth centuries create an atmosphere that is classical, authentic and most of all relaxing. Large and elegant lounges, illuminated by the Tuscan sun and open onto the gardens of the historic Villa, have been added in the course of the last two centuries to the fascinating, ancient wine-cellars and horse-stables. One of the common areas of the Villa provides technology services for the guests. There is a computer with Internet access, wireless Internet, printer, scanner, telephone, and fax machine. Villa Ulivi guests are able to make themselves as connected or separated from the outside world as they choose. "I had never known Florence more herself, or in other words more attaching, than I found her for a week in that brilliant October. She sat in the sunshine beside her yellow river like the little treasure-city that she always seemed." There are also a variety of other benefits that Villa Ulivi has to offer. Guests are encouraged to use the Villa's rooftop terrace, backyard patio and wine cellar for romantic social gatherings. Upon request, the management can organize private parties that are catered by some of Florence's best chefs. Cooking classes and activities are periodically planned on the Villa grounds. Guests may also use the chapel for private religious services and the backyard barbeque grill for family meals. 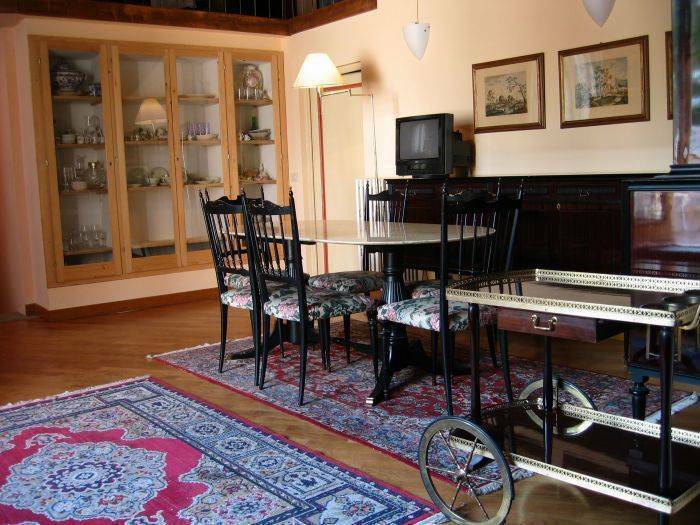 SINGLE, DOUBLE AND TRIPLE ROOMS Rooms at Villa Ulivi are spacious and comfortable retreats that are furnished with local antiques that add charm to the pleasant atmosphere that guests experience. Each room offers a unique arrangement of double and / or single beds to surely meet any group's needs. Windows illuminate the living area and bathe the room with the wonderful Tuscan sun. Views overlook the Villa's gardens and the romantic city of Florence with its rolling hills as a backdrop. The floors are covered with a beautiful, historic wood and walls are done with hand painted fresco designs. Each room features a private bathroom that is tiled with prestigious Italian marble and is equipped with a lavish tub or shower. Every suite at Villa Ulivi is unique, just as it would have been with the original owners in the fifteenth century. Distinctive furniture sets and decorations in each room help to create a spectrum of Tuscan sights and atmospheres that is sure to please. Villa Ulivi believes that the rooms are only one piece of the entire puzzle. Guests immediately notice a more relaxing nights rest followed by mornings that seem crisper and brighter. There is a cool, gentle breeze that flows through the hills at night and the dawning sun calls upon the pleasantly chirping birds. Enjoy the cosy bed until the scent of breakfast creeps up the stairs to greet you. The fresh breakfast, with Florentine bread, coffee, tea, juice and home-made cakes and jams, is served each morning in the Villa's elegant lounges during the winter and on the outdoor terraces, beneath the pleasant shade of the luxuriant mimosa trees, during the summer. After breakfast has concluded, it is time to discover the historic city of Florence and the wonderful hills of Tuscany. Enjoy! THE 4 PERSON APARTMENTS At Villa Ulivi three apartments, that are suitable for up to 4 persons, are also available. Their names are: Melograno, Alloro, Gelsomino. 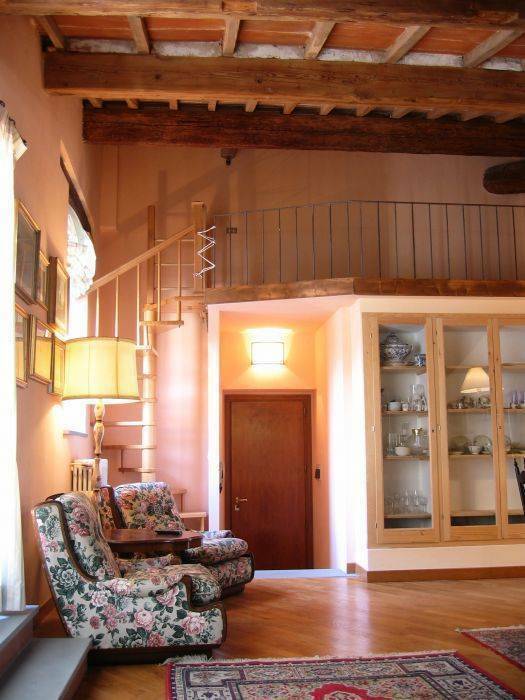 Melograno is a two-storey apartment that brings to life the cosy, Tuscan atmosphere and will sleep four people. The lower level is one long, open room. The walls are done with a Florentine marbled design and an elegant fresco pattern around the ceiling. The floors are old, red brick with white marble accents. At one end there is a kitchenette with sink, gas stove, refrigerator/freezer, microwave and dish washer. There are two solid wood tables, one being an elevated four person dining table and the other one a smaller breakfast table. The opposite end of the room is furnished with two divan-beds. Up the staircase one will find the master bed and bath. The master bedroom is very spacious and features a queen sized bed. The large semi-circle window floods the room with light and fresh air. It has a two closet antique wardrobe and matching dresser. The full upstairs bathroom also has a washing machine for guests' laundry needs. Alloro is a one-storey apartment that will sleep up to four people. It features a large central room for dining and relaxing. The room has a sitting area with couch, coffee table and television. There is a sofa-bed at one end of the room for extra sleeping space. At the other end of the room is a lovely four person dining table with a view out to the terrace. This room also has its own access to the suite's terrace. The deck has retractable awnings and an outdoor dining area. The view from this perch is simply priceless. The beautiful and historic cityscape of Florence lies directly in front of the terrace. One is able to see the famous Cathedral dome and Giotto Tower. 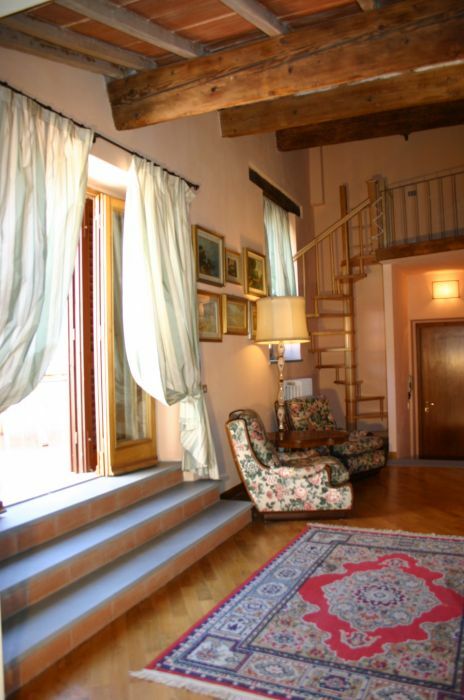 To the right one can gaze upon the rolling Tuscan hills and to the left the Villa's olive orchard. The master bedroom has a queen sized bed with end tables and a double closet. The room has a slanting, wooden beam ceiling with two skylights. The master bedroom also has a private full bath. The second room has a single bed, view of the terrace and full bath. The apartment has an air conditioning system and a kitchen equipped with a microwave oven, a refrigerator/freezer, dual sink, gas stove and washing machine. Gelsomino is a one-story apartment that opens to a long central living room and is capable of sleeping up to four people. This area has two couches that section off a portion of the room for social gathering and conversation. The room has a variety of local Tuscan artwork to help create a Florentine atmosphere. There is a large dining table at the end of the room with a view of, and access to, the terrace. 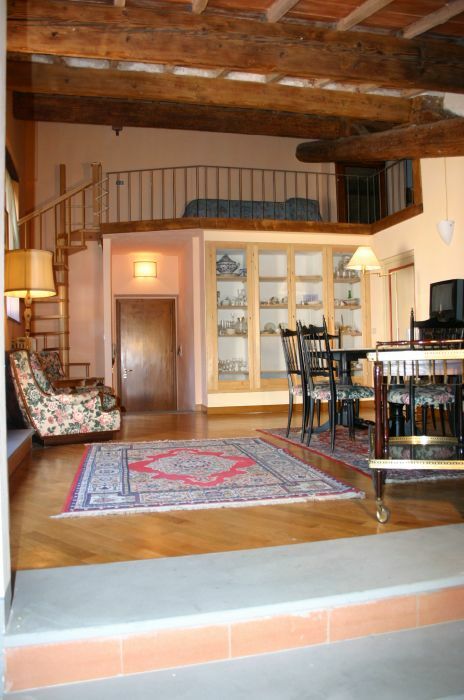 Off the central room is a kitchenette with a beautiful wooden beam ceiling and a skylight. It is equipped with a dual sink, gas stove, microwave, refrigerator/freezer, washing machine and air conditioning. The first room has two single beds and a skylight. It shares a bathroom with the master bedroom down the hall. The master has a queen sized bed and a high, wood beam ceiling. This room also has its own access to the suite's terrace. The deck has retractable awnings and an outdoor dining area. The view from this perch is simply priceless. The beautiful and historic cityscape of Florence lies directly in front of the terrace. One is able to see the famous Cathedral dome and Giotto Tower. To the right one can gaze upon the rolling Tuscan hills and to the left the Villa's olive orchard. THE 6 PERSON APARTMENT At Villa Ulivi one apartment, that is suitable for up to 6 persons, is also available. Its name is Magnolia. Magnolia is a one-storey apartment with a small loft overlooking the living room and is capable of sleeping up to six people. The central room is comprised of a sitting area with two relaxing, antique chairs and a large six person dining table. The high ceiling with exposed wooden beams gives the apartment a historic feel. The walls are decorated with a variety of fresco paintings. There is a separate kitchen off the central room that is lit by three ventilation windows and a skylight. It has a breakfast table, refrigerator/freezer, dual sink, microwave and gas stove. The master bedroom has a high slanting ceiling, marbled wall design and beautiful wooden floors. The massive bay windows look over a section of the back patio and Villa yard. The room has a queen sized bed, long wardrobe closet, dresser and make-up table. The master bedroom connects to a full bathroom, with lovely Vietri tile, and a single bedroom. Across from the master bedroom is a double room with two single beds. 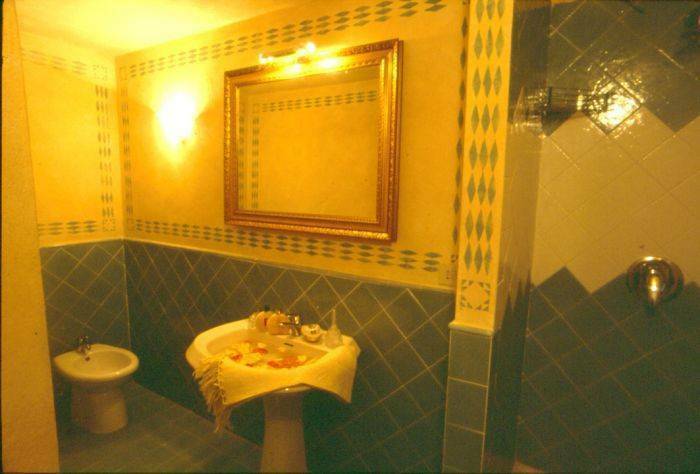 This room has access to its own full bathroom. The final bed can be found in the loft, connected to the main room by a beautiful, wooden winding staircase. The most popular asset of this apartment is the romantic private terrace. This spacious and quiet terrace overlooks the surrounding vineyards and olive orchards. It has an outdoor table that is nestled beneath the shade of a wonderful, Tuscan vine canopy. Even if it is situated very next to the centre of Florence, Villa Ulivi is immersed in a large park and is surrounded by vineyards and olive orchards. It is the ideal place to stay if you want to visit Florence and its surroundings. In case of no show or late cancellation (within 8 days before the arrival date), the first night amount will be charged. 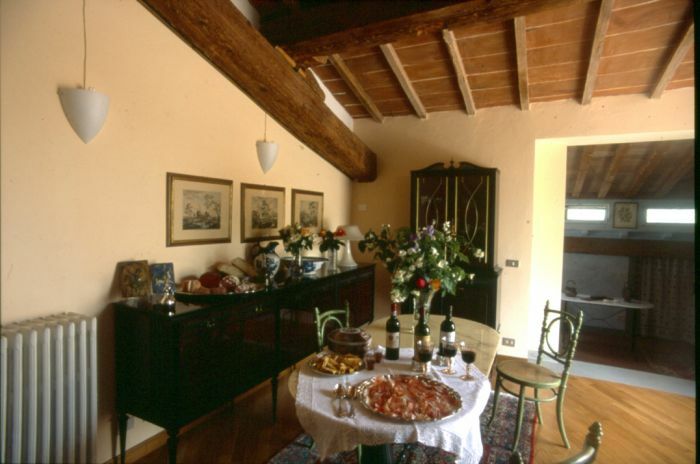 Villa Ulivi is located in an elegant residential area of Florence, very close to the centre and to the main monuments. The residential area where Villa Ulivi is located is Piazza della Libertà (Liberty Square) – Fortezza da Basso (Saint John's Fortress). Villa Ulivi is located very close to Saint John's Fortress, the Exhibition Centre where "Pitti Immagine" Fashion Shows are held. Although located near the centre of Florence, Villa Ulivi is immersed in a large park and it is surrounded by vineyards and olive orchards. The bus stop is located 5 minutes away from Villa Ulivi. Fortezza da Basso – Piazza della Libertà. Following the directions to "Viali di Circonvallazione – Stadio" and to "Fortezza da Basso – Piazza della Libertà", you get into the ring road of Florence; once you have reached Piazza della Libertà (Liberty Square), you are supposed to follow the directions to "Via Bolognese – S. S. 65 della Futa". This way, you are led to take Via Bolognese, where you meet Villa Ulivi. From Florence "Santa Maria Novella" Train Station, you are supposed to take the bus number 25 / 25A or a taxi-cab. If you take the bus, you need to get off the bus once the bus has reached "La Pietra" bus stop, located in Via Bolognese. Then, you need to walk until you meet, after 100 metres, Villa Ulivi at #163, Via Bolognese. you need to reach "Santa Maria Novella" Train Station by "Vola in bus", the bus service that links the Airport and the Station; then, from "Santa Maria Novella" Train Station, you need to take the bus number 25 / 25A. Once you have taken the bus number 25, you need to get off the bus when you reach "La Pietra" bus stop, located in Via Bolognese, and to walk until you reach, after 100 metres, Villa Ulivi (#163, Via Bolognese). Bus number 25 (whose stop is located 200 metres away from Villa Ulivi) reaches the city centre in 10 minutes.